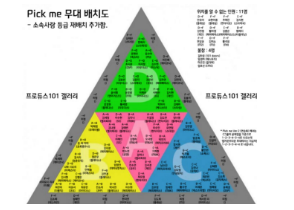 Produce 101: What Is It For? 101 Girls are gathered on stage. They are wearing the same clothes, singing the same song, and dancing the same dance. But, who are they? And why? ‘Vote for your girl.’ This was the subtitle for the Korean TV show called ‘Produce 101’. This programme introduces one hundred and one young female trainees from all different entertainment companies. The girls need to stay in a dormitory and every training process is filmed and go on the air. Their final goal was to make a girl group (a pop group of female members who sings and dance in the stage) of 11 members. Because Korean-pop is getting more and more popular, ‘Mnet’, one of the broadcasting company wanted to make people vote for only eleven girls that voters would prefer. And the voters for the girls was: all the nation. Trainees from all the different companies are gathered, and they are graded from A level from F level depends on their first audition. Then different colora of hoodies are given to trainees depending on the level, and that even influences the position of the performance stage. This programme was loved and spotlighted by many viewers, however, as much as <Produce 101> is loved, it has significant disadvantages. First, the fairness of this programme’s election method was a big issue. The production crew emphasized the fairness of this programme by mentioning “The girls are one hundred percent elected by the entire nation”. But from the experiment of ‘Nocut News,’ it was revealed that multiple voting was available if they make different accounts by many different SNS. So they reported that there could be an illegal ballot, and the production crew admitted that before the final election. Second, the inequality of the trainees was another big issue. Even though we say the system was perfectly fair and equal, we couldn’t say it could also influence equally the decision of the voters. Trainees who had specific stories or outstanding was filmed more. That lead voters to see them more, feel them more and empathize with certain trainees. We can say that the programme was unfair from the beginning and some of the trainees served as back-up dancer. So Korean broadcasting monitor committee analysed the correlation between the time how long the trainees are exposed on the air and their ranking. As expected, the average time exposed of trainees among 1st and 35rd was about 1 minute, and the average time of 62st to 96st were about 12 seconds. Also, the trainees whose personal stories introduced specifically got more votes than whose were not. The experiment showed the frequency of the trainees filmed was proportional to their ranking. Third, the written contract which was made between the trainees and the programme is a good example that shows how the trainees’ situation was desperate. There was a clause that not even one of the trainees was not contracted to get paid. Also ‘Mnet’, the broadcasting company said they are not going to hold any liability towards the trainees. The contract was written that any trainees cannot file for the company. However, Mnet created certain point of view of voters by doing ‘devil’s editing’ which referred to the editing that making bad perspectives thoughtlessly. The programme wanted trainees whose reactions was fun or has noticeable character. As an example, there was a ‘personality test’ which was tested secretly which was totally able to manipulate voters’ decision. One of each trainees were staying in the small room to interview, and the trainee was with one of the cameramans. Then, the cameraman intentionally drop the camera and act like the situation is real and done by mistake. After few seconds, the director comes into the room and gets angry. Some of the trainees’ response are revealed there. They said they dropped the camera as mistake and it’s their fault. However, the director says the camera costs three million dollars. The trainee starts to call their company to report and cries. Then, some of the trainees calling their company where they are belonged to are filmed and told it was just a fake test. Even though a person has a really good personality, is it able to say that the expensive camera is broken and it’s one’s fault? Is it able to be responsible about that could be considered too much? Even though the test process are too cruel and harsh, they cannot have dissatisfaction with the process because they are all in the same situation: to debut. Even the company doesn’t sue with the process because it is the good chance to build the awareness of the company. From these results, it emphasizes the ‘fair competition’ is close to illusion. Trainees’ dream and ranking were decided by the production crew’s way how he filmed. It was totally unfair that the basic judging standard was not based on the trainees’ capacities but the time how much they were exposed. The thing that trainees needed to care became what kind of image was made through netizens and the time on the air. So the perspective and viewpoint that we need to have as audience and voters is, we need to consider and think whether the production crew failed to have the ‘fairness’ that the programme must have it at least for more exciting fun as a show. TV shows that help people end their day with happiness could be ruining the trainees’ life thoughtlessly. Using the trainees’ urgency, weren’t the voters infringing the rights and fairness of the girls? Hi Ju Eun– Thank you for your interesting and thought-provoking article. It makes me wonder: how much money does Mnet make from this program? Millions?